The outdoor meeting for April was a joint event with Southampton and District Bird Club to Winspit near Worth Matravers in Dorset. The journey by car was about fifty miles with heavy traffic and tortuous roads so it was a relief to get out on foot in the village of Worth Matravers. Entering the field at the edge of the village was like opening the door of the Tardis into another world. Sheep and white fluffy lambs frolicked in the green rolling downland with freshly arrived Warblers singing in the hedgerows. Warm sunshine and the promise of a fine day relaxed the mind and lifted the heart especially on the downhill sections of the walk. Starting from the village of Worth Matravers the walk continued along the dry valley towards the sea and into the abandoned quarry at Winspit. Some time was spent looking around the quarry and out to sea before retracing a few steps to climb up to the South West Coast Path. On reaching the coastguard lookout point on St Aldhem’s Head the walk turned inland to return to Worth Matravers via Weston Farm. Although the walk was only four or five miles it consisted of many stops to admire the scenery and the birdlife. The Winspit valley appears to be a magnet for migrating birds including several varieties of Warbler and of course Swallows. Chiffchaff, Willow Warbler, Whitethroat and Blackcap were all heard singing. Linnets and a solitary Yellowhammer joined the usual Blackbirds and Robins. Two Wheatears were seen perching on top of a stone wall but most likely they were just resting during their migration. 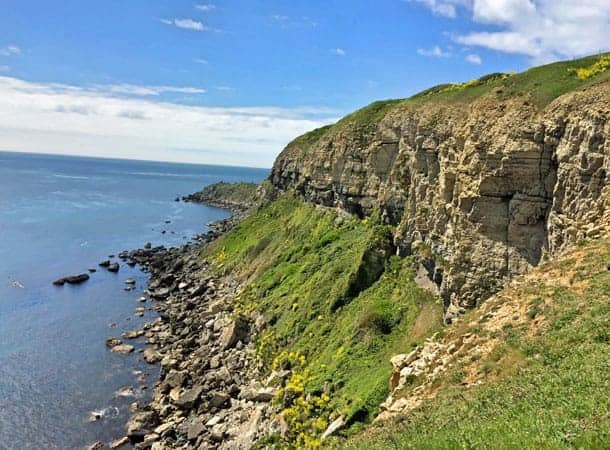 The cliffs host many seabirds but when walking along the top it is not always possible to see over the cliff face. Occasionally however an inlet allows the cliff face to appear. Kittiwakes and Fulmars perched on ledges and on one occasion a male Peregrine stood guard over a nesting female. A lone Kestrel appeared above the cliffs being discouraged by a persistent Crow. Kestrels are not as common as they once were and it was a sign of the times that more Peregrines were seen than Kestrels. The yellow flowers of Wild Cabbage were the most abundant flower along the cliff top with smaller patches of Horseshoe Vetch and Kidney Vetch. Thrift was starting to come into flower and the young spikes of Meadow Clary were already turning blue. 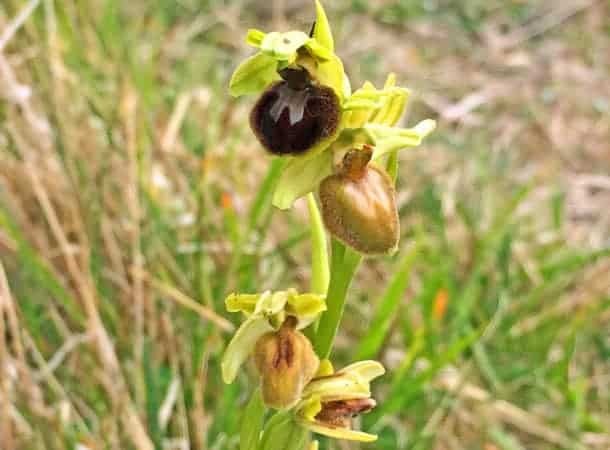 Early Spider Orchid was in flower on the floor of the quarry at Winspit. It seems incredible that evolution can have produced a flower that imitates a spider so precisely and it was a privilege to see it. A Small Copper butterfly was warming itself on the stone of the quarry and Wall Brown butterflies flew over the short grass on the cliff top. The Wall Brown has a black eye pattern with a white spot similar to other browns but the seven circular patterns on the back of its rear wing are unique. It is a pity that this attractive butterfly which was once common is now restricted to a few coastal sites. A Ruby Tiger moth flew down onto the path with a flash of red between the wings. When it landed however it played dead even when it was turned over in order to see the underside. An Oil Beetle braved the feet of walkers to scramble along the dusty path. This insect has an interesting life cycle in that larvae crawl up to flowers and wait to hitch a lift on feeding mining Bees.